Researchers at Delft University of Technology have released a major update to their decentralized and pseudo-anonymous BitTorrent client. The new Tribler has its very own blockchain that tracks how much people are sharing, so users can be rewarded accordingly. This should ultimately improve the efficiency of the client's Tor-like protection. The Tribler client has been around for over a decade. We first covered it in 2006 and since then it’s developed into a truly decentralized BitTorrent client. The project is not run by regular software developers but by a team of quality researchers at Delft University of Technology. There are currently more than 45 masters students, various thesis students, five dedicated scientific developers, and several professors involved. Simply put, Triber aims to make the torrent ecosystem truly decentralized and anonymous. A social network of peers that can survive even if all torrent sites ceased to exist. “Search and download torrents with less worries or censorship,” Triber’s tagline reads. With the latest release, Tribler 7.0, the project adds another element to the mix, it’s very own blockchain. This blockchain keeps track of how much people are sharing and rewards them accordingly. “Tribler is a torrent client for social people, who help each other. You can now earn tokens by helping others. It is specifically designed to prevent freeriding and detect hit-and-run peers.” Tribler leader Dr. Johan Pouwelse tells TF. Pouwelse, who aims to transform BitTorrent into an ethical Darknet, just presented the latest release at Stanford University. In addition, the Internet Engineering Task Force is also considering the blockchain implementation as an official Internet standard. This recognition from academics and technology experts is welcome, of course, but Triber’s true power comes from the users. The client has gathered a decent userbase of the years but there sure is plenty room for improvement on this front. The anonymity aspect is perhaps one of the biggest selling points and Pouwelse believes that this will greatly benefit from the blockchain implementation. Triber provides users with pseudo anonymity by routing the transfers through other users. However, this means that the amount of bandwith used by the application inceases as well. Thus far, this hasn’t worked very well, which resulted in slow anonymous downloads. “With the integrated blockchain release today we think we can start fixing the problem of both underseeded swarms and fast proxies,” Dr. Pouwelse says. 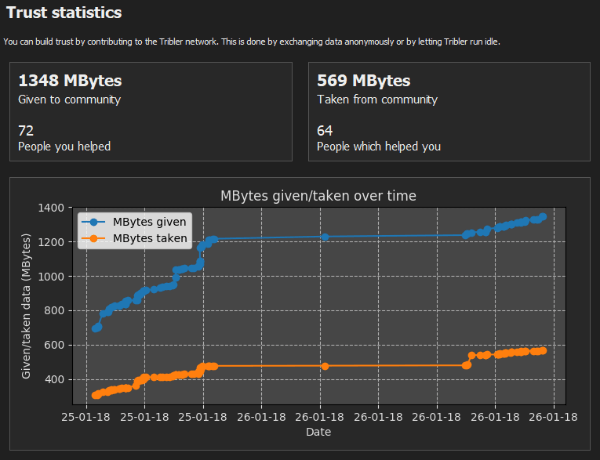 Tribler provides users with quite a bit of flexibility on the anonymity site. The feature can be turned off completely, or people can choose a protection layer ranging from one to four hops. What’s also important to note is that users don’t operate as exit nodes by default. The IP-addresses of the exit nodes are public ouitside the network and can be monitored, so that would only increase liability. So who are the exit-nodes in this process then? According to Pouwelse’s rather colorful description, these appear to be volunteers that run their code through a VPN a or a VPS server. “The past years we have created an army of bots we call ‘Self-replicating Autonomous Entities’. These are Terminator-style self-replicating pieces of code which have their own Bitcoin wallet to go out there and buy servers to run more copies of themselves,” he explains. Some might question why there’s such a massive research project dedicated to building an anonymous BitTorrent network. What are the benefits to society? The answer is clear, according to Pouwelse. The ethical darknet they envision will be a unique micro-economy where sharing is rewarded, without having to expose one’s identity. “We are building the Internet of Trust. The Internet can do amazing things, it even created honesty among drugs dealers,” he says, referring to the infamous Silk Road. “Reliability rating of drugs lords gets you life imprisonment. That’s not something we want. We are creating our own trustworthy micro-economy for bandwidth tokens and real Bitcoins,” he adds. People who are interested in taking Tribler for a spin can download the latest version from the official website.